“I shall be your husband and you shall be mine. Our desire shall be for each other. Neither shall rule the other. A few more things require doing around the home before I can trial sail ‘Minnow’. 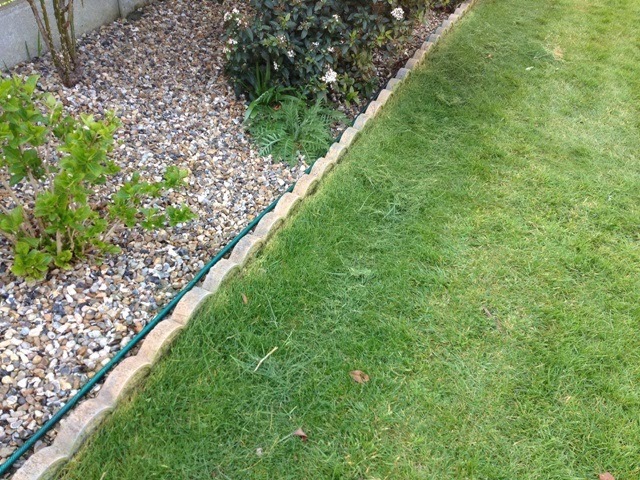 One pressing job I had to do was to cut long grass at the borders of the lawns. 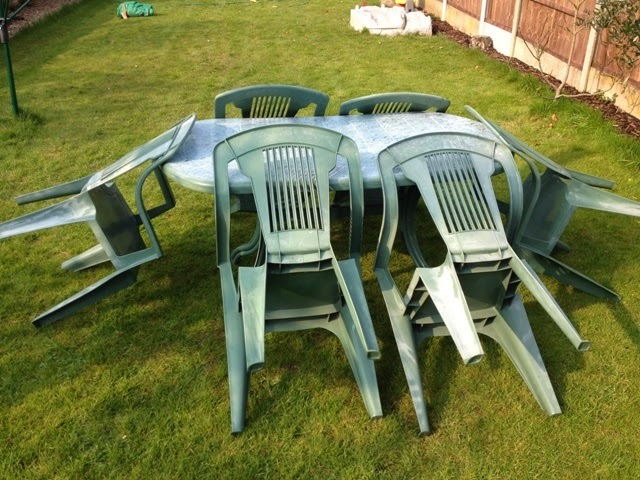 I couldn’t do so, because my old Flymo strimmer got itself twisted up in knots! The nylon line kept slipping from the spool, so that it tangled around the spindle. 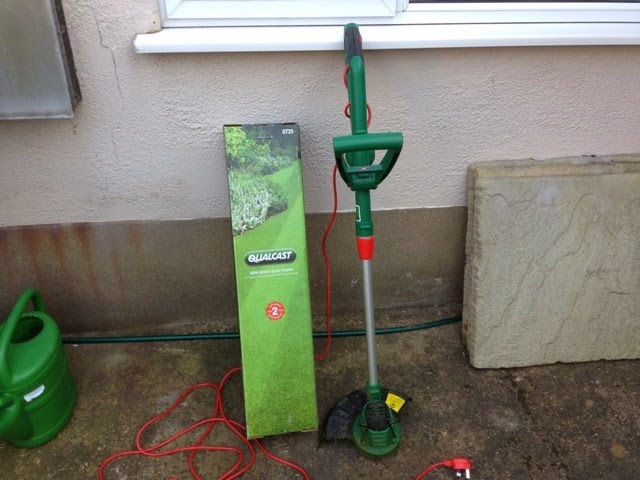 Therefore the time came for acquiring a new strimmer, and today I bought a GT25 Qualcast for £23.99 from Homebase. Having tested the strimmer, I think I have a bargain, but time will tell. 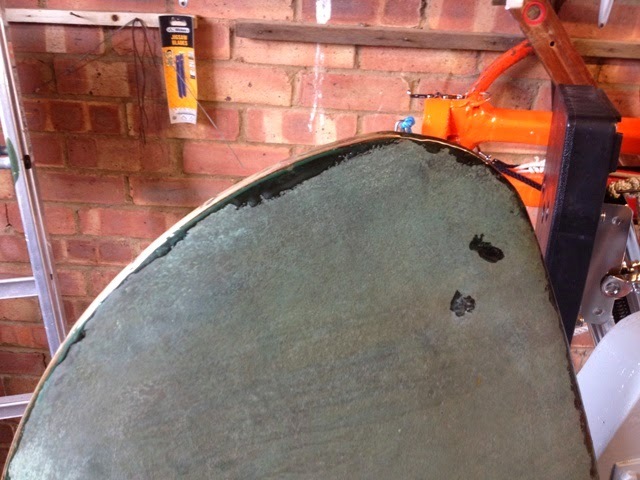 A close inspection of ‘Minnow’s’ rudder revealed minute gaps between the fibreglassing and the metal strip protecting the leading edge. 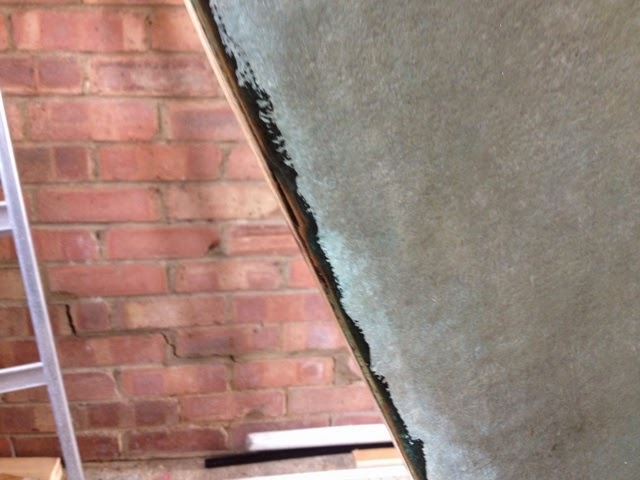 Instead of being encapsulated with fibreglass folded over the edge, the builder appears of have taken the cloth as far as the brass capping piece. That may have been OK when built, but over time tiny gaps have developed. The result is that water could enter the plywood, possibly causing delaminating. Water permanently trapped within the sheathing would not be good for the plywood. Well, today, I cleaned up the leading edge and filled the gaps with epoxy. 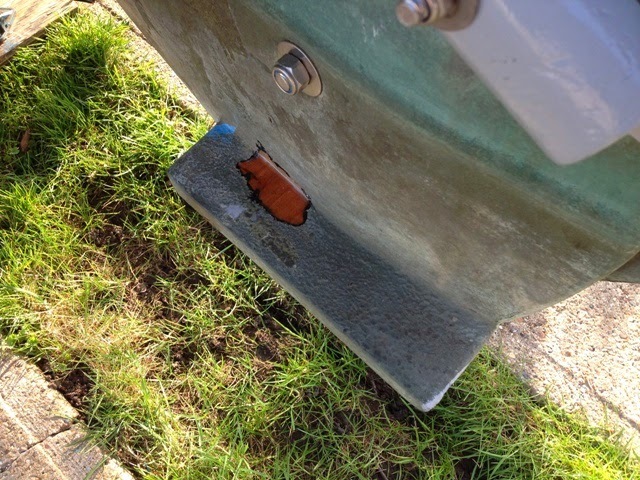 Providing water tightness can be maintained, there should be no further problem. 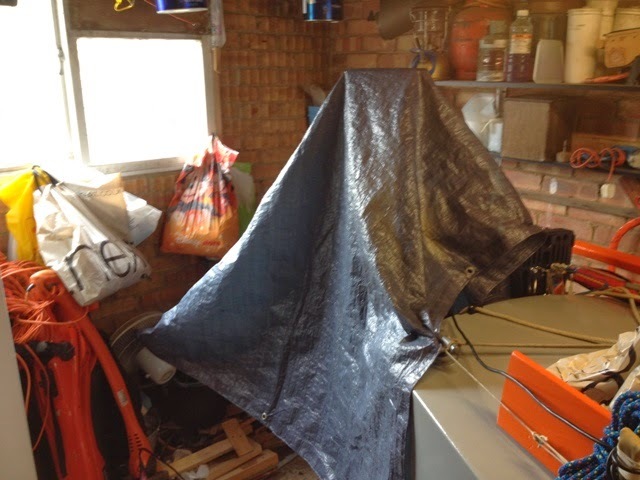 Because the temperature was only 9 degrees Celsius I made a tent from a tarpaulin that I arranged over the rudder for trapping warm air from my miniature blow heater and an electric inspection lamp. 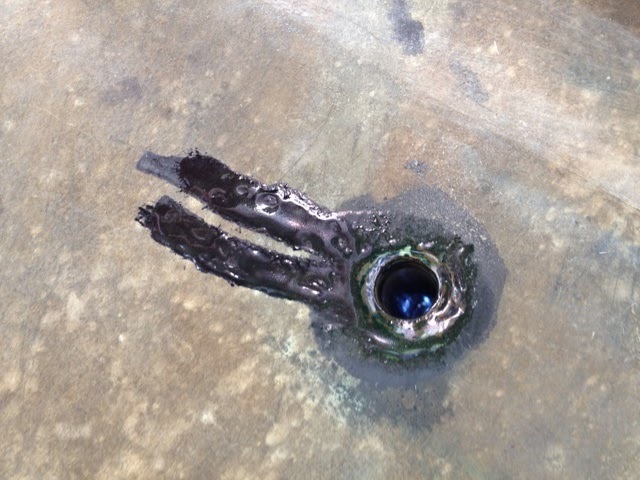 By late afternoon the epoxy had hardened. As the month of March draws to a close, there are only a few more jobs to be done before I shall be free to take ‘Minnow’ for a trial sail. 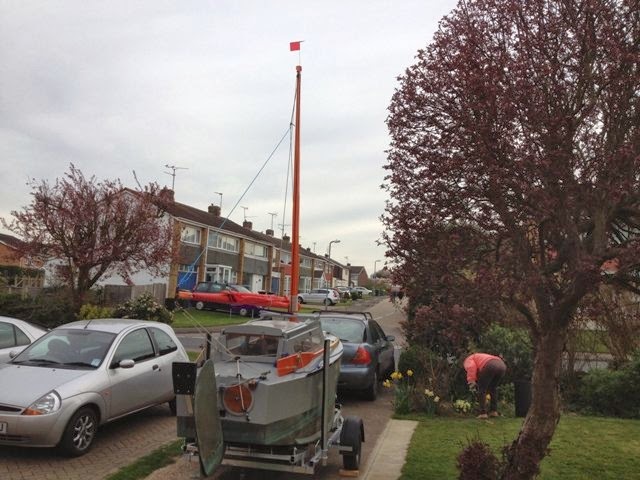 Therefore I’m hoping the weather will play ball during the first week of April for a shakedown sail. 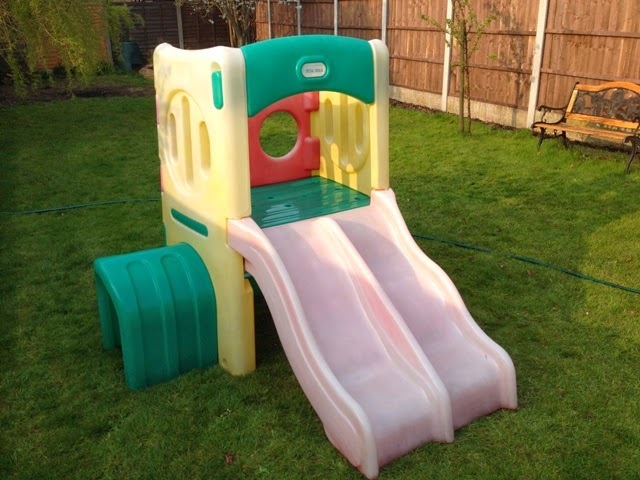 In view of accomplishing this goal, I set about cleaning garden furniture, including the ‘little tikes’ play slide, in readiness for our grandchildren who will be visiting on Mothering Sunday. Once a month at our church, a number of us gather for an afternoon to engage in creative activities, listen to speakers and to socialize. The formal nomenclature on the church calendar informing members of dates and times of our meetings is, ‘Friends on Friday’. Mostly we are the older folk who have retired and have time to socialize on the last Friday of each month. The purpose of our meetings is to strengthen friendships and build one another up in the love and knowledge of Jesus. This coming Friday, the subject will be ‘Reminiscences’, and of course, we shall have much to chat about and to share. It has been suggested that we should focus on the 1960s and 70s, but some of us will have recollections dating back considerably further. The afternoon will start with us having tea, biscuits and cakes and as we eat and drink, we’ll answer questions to a written quiz, based on the 60s and 70s. No doubt we shall see old photos and listen to songs of that era in the hope that they will trigger memories. Between us we may share nostalgic moments. One thing I came across recently dates back to 1948. 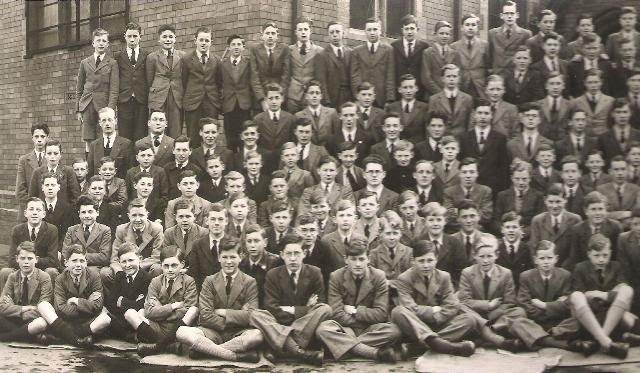 It is a school photo of over 400 pupils and their teachers. 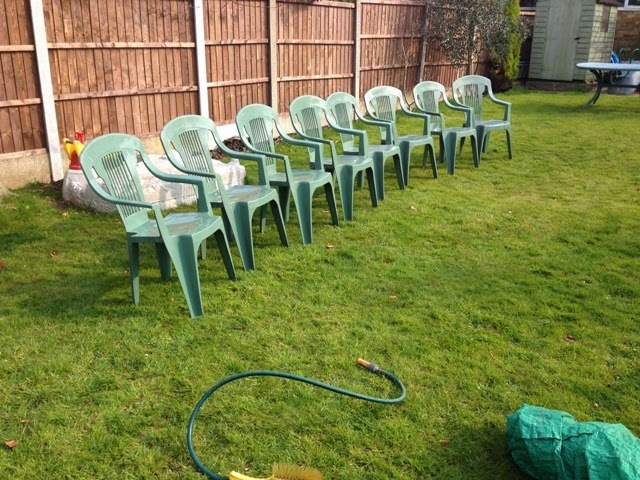 I’m sat in the front row, seventh from the left. I was fascinated to note that out of the 42 children in the front row, only two wore wristwatches, and I was one of them. 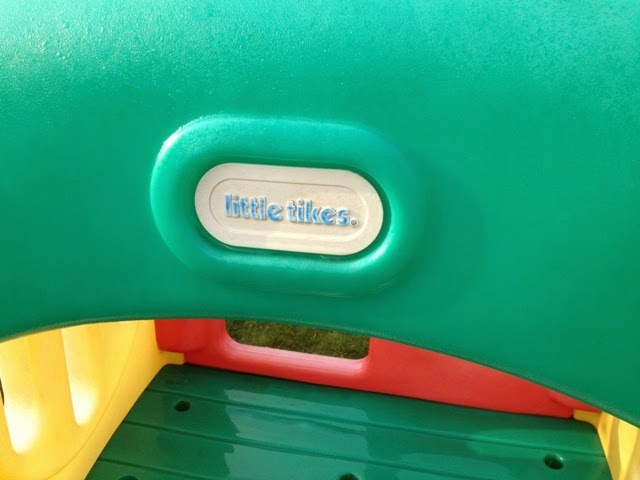 Five had pens in their jacket pockets, and I was one of them. 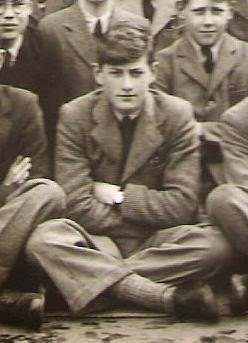 Almost half of these thirteen to fourteen year olds were dressed in short trousers – I wore long ones. Every pupil was dressed in jackets and all wore school ties. The Huish’s Grammar School motto, ‘Spe Certa Quid Melius’ (What better than sure hope), printed on the photo’s margin, was not fully appreciated by me. How could hope be sure? Now I know there is no surer hope than that of a Christian who puts his trust in his Lord. When I was young, household lighting was simple. I can remember my sister having gas lamps in her home. Maybe a mantle would blow, but replacing it was not a problem. By today’s standards gas lighting was ineffective; however, it was better than its predecessors: candles and oil lamps. Gas always posed a danger on account of being toxic and volitile. One spark in a gas filled room would bring about a catastrophic explosion. Electric lighting followed gas. Back in the 1940s, so-called modern homes were generally fitted with at least one light in each room. Bayonet type incandescent bulbs between 40 and 100 watts were standard, and they could be bought from a local store - even Woolworths for next to nothing. Later in the 60s it became common to have more than one light in a room. Wall lights, standard lights and table lamps were fashionable for creating atmosphere. Demand led to the development of different types of bulbs. My wife and I had a fluorescent light in our kitchen, because we thought it was ultra-modern complementing our ‘G’ Plan furniture. Anyway, it satisfied us at the time. In recent years immense changes have taken place with the development and marketing of numerous types of electric lights; there are halogen, tungsten, quartz and LED lights. The priorities have been quality of light and conservation of energy. Consequently there’s been a vast array of fancy light fittings sporting numerous low consumption bulbs, perhaps as many as ten or twelve in one fitment. The drawback to these elaborate fittings is replacing malfunctioning bulbs. 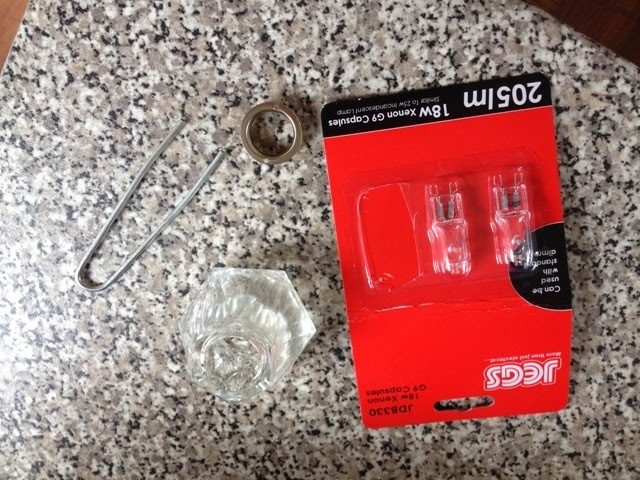 In my household, there’s not a month goes by without me having to replace defunct bulbs, and they are not cheap, and sometimes difficult to obtain. Today, as part of my household maintenance, I replaced a bulb in my kitchen. To get at it I had to employ a special wire tool for removing a crystal shade before I could extract the bulb. 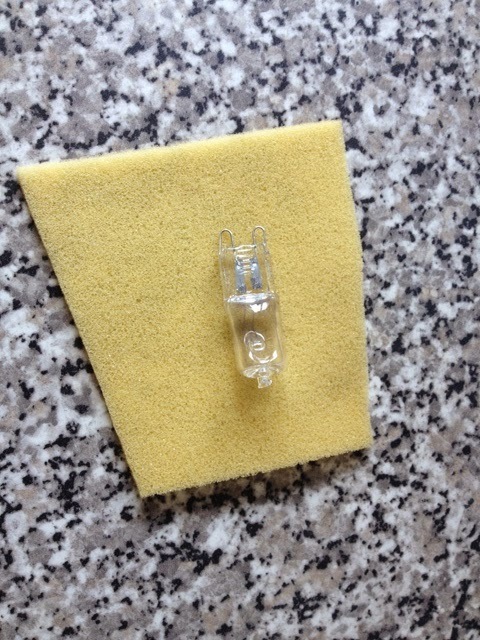 Furthermore, instructions on the packet containing the new bulb informed me that I was not to touch it! Perched on a stepladder I found difficulty in delicately inserting the tool into two minute holes and rotating it for unscrewing a retaining washer for the shade. Fortunately, I had previously handled quartz bulbs by holding them with a small piece of artificial sponge that I keep for the purpose. By persistence rather than dexterity, I managed to insert the new bulb and replace the shade. 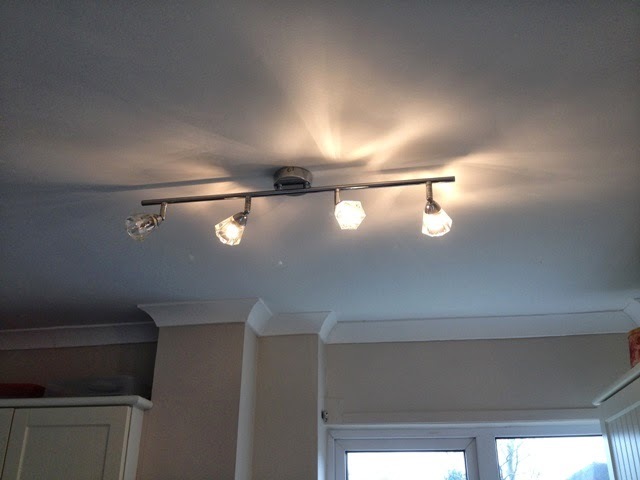 I felt a certain triumph of achievement after overcoming the difficulty, and I was chuffed that every bulb was working. 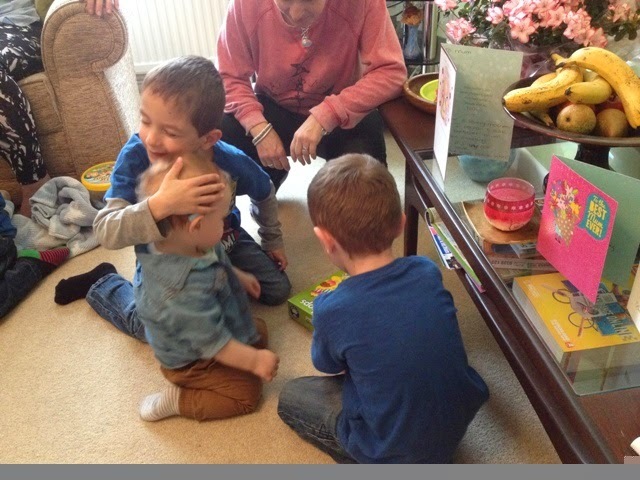 Today was busy for me. First thing, my wife and I went shopping. 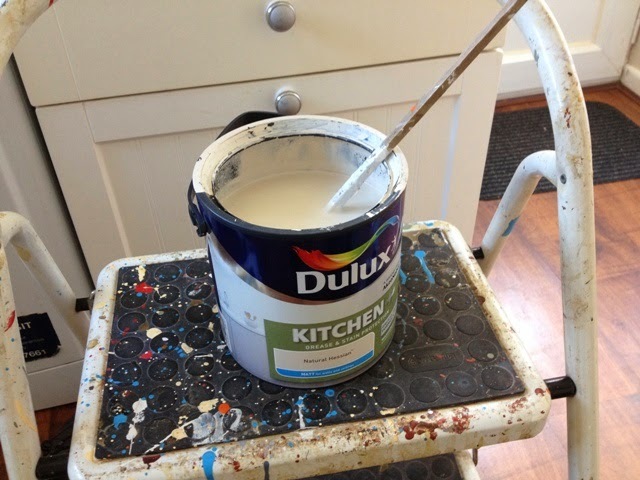 Back at home I repaired indentations in a wall at the top of the stairs and painted the wall. After lunch I cleaned the exterior of the windows and their frames, plus two doors. I am wondering what next my wife will want done. She knows that if I go off sailing, I could be away for a while, and I won’t be around to attend to practical matters. New bedroom furniture will be arriving on Wednesday, and the team delivering it will want an empty room for assembling wardrobes. That means moving the double bed into the front bedroom. When the furniture has been assembled, the bed will have to be returned and put together. There’s always something that requires doing. I have to replace a bulb in the kitchen and join a garden hose to the outside tap. I can guarantee there will be more jobs requiring attention before ‘Minnow’ and I can make our escape. The car has to be serviced and have a MOT. My wife is not opposed to me going sailing, and she has never denied me the freedom to do it. She recognizes how much I enjoy cruising boats, and the health benefits I gain by doing so. I always come back fitter than when I set off. At this point in time, I’m not a hundred percent in terms of health, but I’ll give it a go to see how I get on. There’s no dishonour in abandoning my attempt if I find I cannot cope. All things come to an end, and I’m no exception. There’s a limit to what my feeble body can do. The time may not be far away when I shall have to cast an anchor for the last time; meanwhile, I live from day to day with thanks to my God for His wonderful grace and providence. There’s always new hope for tomorrow. 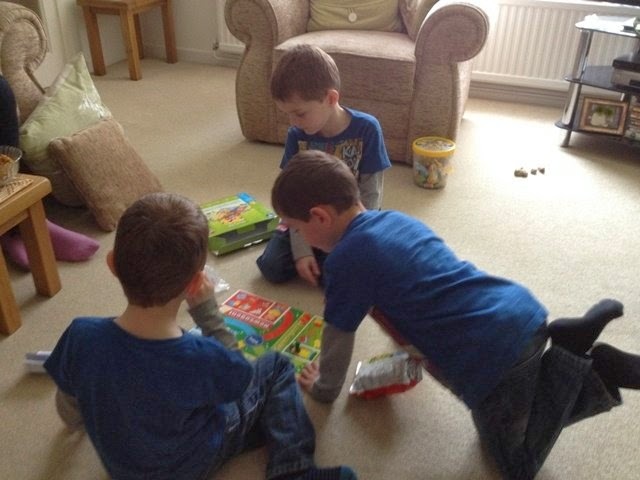 When I was redecorating the back bedroom, the furniture was stacked on the landing and in the front bedroom. This was a necessary inconvenience. 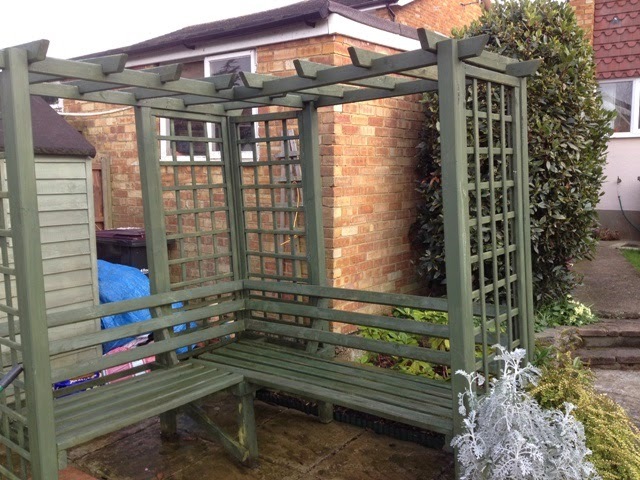 The ultimate aim was not only to redecorate the bedroom, but replace the old furniture which was looking a bit tired and outdated. 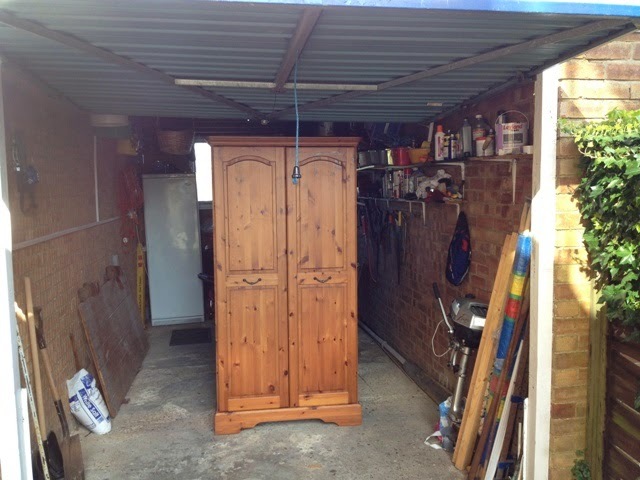 To that end I advertised the solid pine wardrobes, drawers and bedside cabinets on Ebay. To my surprise several people placed bids, and the outcome was positively good. This afternoon, the buyer collected the furniture that had been transferred for temporary storage to ‘Minnow’s’ boathouse. Since ‘Minnow’s’ boathouse has become accessible again, I have placed her there to wait for what might be an adventure. 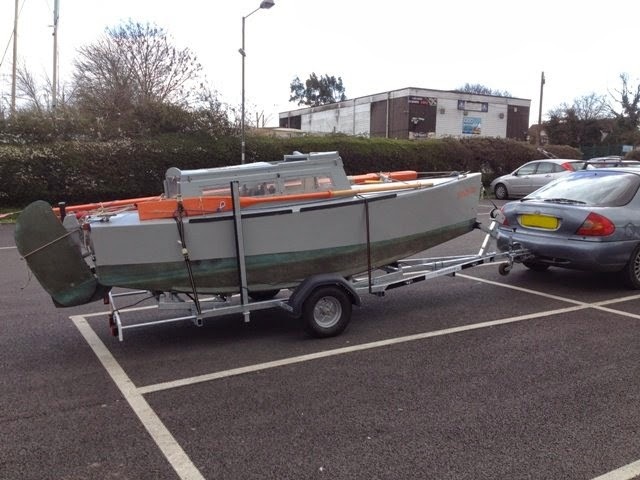 The plan is to attempt sailing to Plymouth from the River Crouch, via the South Coast, starting early April. This depends on a satisfactory outcome to a trial sail before setting off. Both the boat and I have to make the grade, and of course, the weather will play a big part in determining our success. 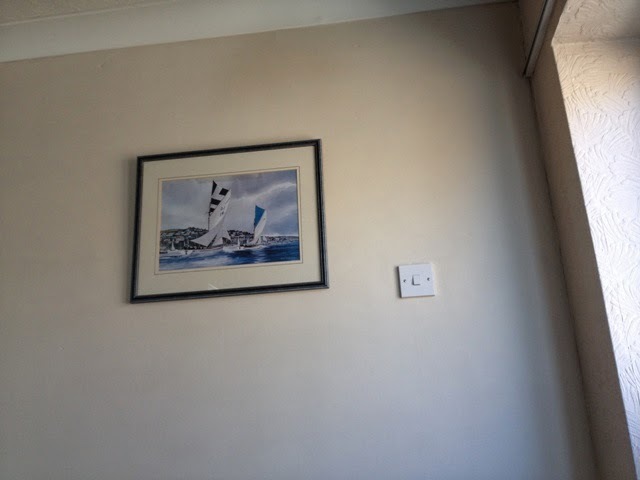 I thought the back bedroom was finished, but I had overlooked a small area that had been plastered, and because the plaster was not completely dry when I painted it, the finish was not perfect. To satisfy myself and my wife, I repainted the entire wall. Thus I was occupied for the whole morning, and I was pleased that my wife liked what I had done. After lunch I checked ‘Minnow’ to see how she had faired overnight when there was heavy rain. 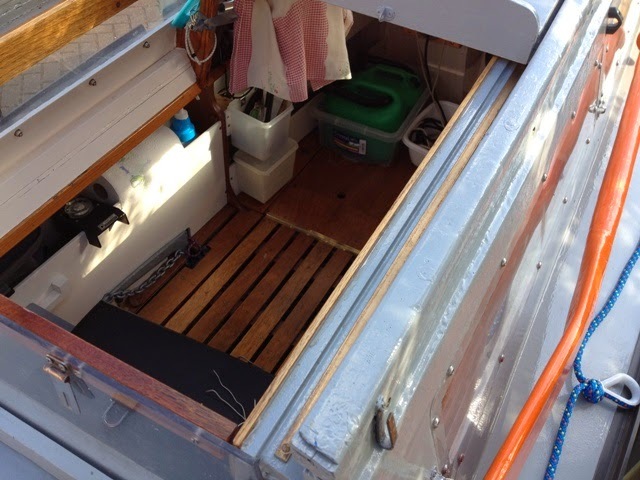 That was the first time she had been exposed to rain, and she passed the test by not leaking through the hatchway, despite being on a slope, so that water collected between the sliders on the cabin roof. 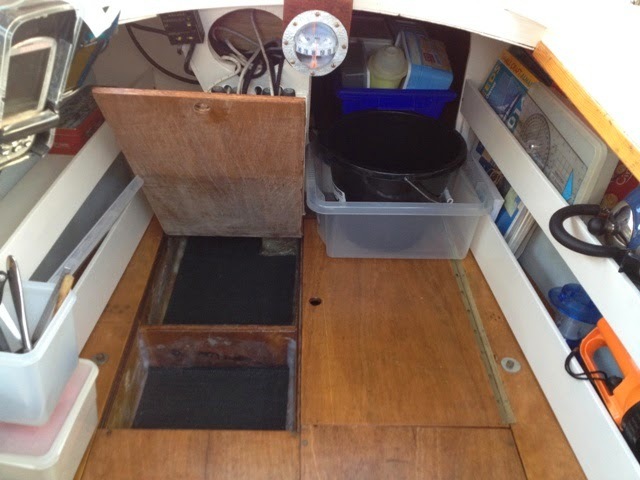 When she is afloat, the hatch will be horizontal in the fore and aft plane; therefore water will not collect between the sliders. The hatch opens smoothly with little effort, but to protect the brass sliders and reduce friction, I treated them with silicone spray. I also applied silicone to the cup in the shaft of the yuloh to minimize friction between it and the yuloh support pin. 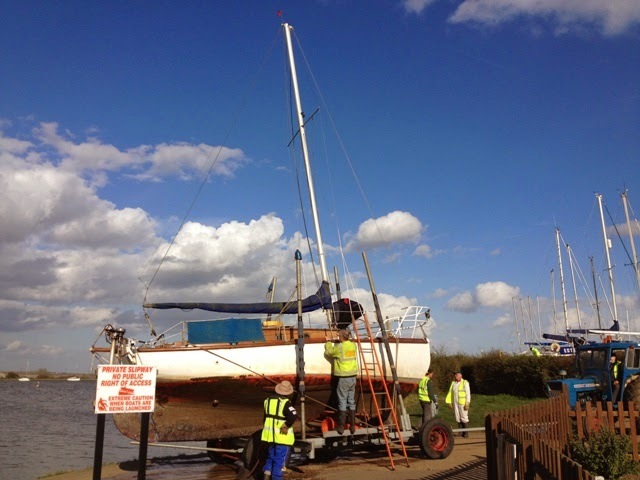 Later in the afternoon I walked beside the River Crouch at Hullbridge where I saw a yacht being taken out of the water at the Up River Yacht Club. I have a feeling the yacht may be a Blackwater sloop. Today, 20th March, is the Spring Equinox when day and night are equal in time at the equator, i.e., there are 12 hours of daylight and 12 hours of darkness. At mid-day the sun’s zenith momentarily hovered over the intersection of the Greenwich Date Line and the Equator. The Autumn Equinox occurs on 22nd September, and in the UK around that time, there may be a greater frequency of gales than at other times, but meteorologists maintain statistics do not support that belief. Whatever the case, both March and September have reputations for being windy. April, the month of showers, follows March, when it can also be windy. Last year during April and May I encountered adverse westerly winds that kept me stormbound for many days. Will this year be different? Could I be blessed with fine weather and fair winds? This is my hope. 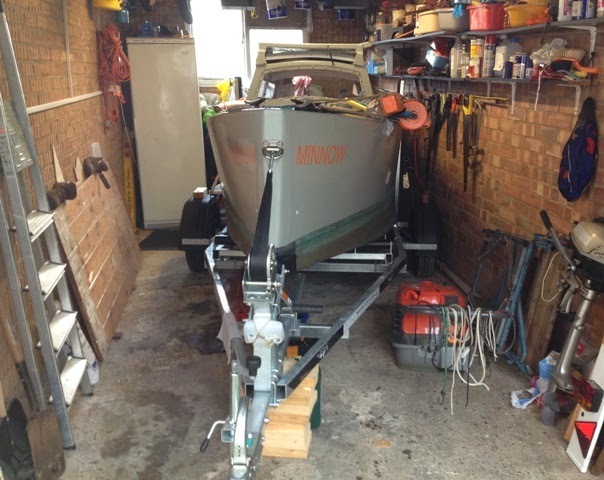 Meanwhile, ‘Minnow’ and her skipper patiently wait for a propitious weather slot, early this April. There is always something that can be done on a boat to improve her. Yesterday I said ‘Minnow’ was ready for an adventure, and so she is, but to help her skipper better assess wind direction, I’ve added a masthead burgee. Technically it’s not a burgee, because it does not have a pointed tail. The chandler described the flag as a ‘racing’ burgee. A cruising burgee is, in fact, a burgee, because it has a tail. When yachts race, their skippers usually fly a pennant of sorts at the stern to indicate their boat is participating in a race. 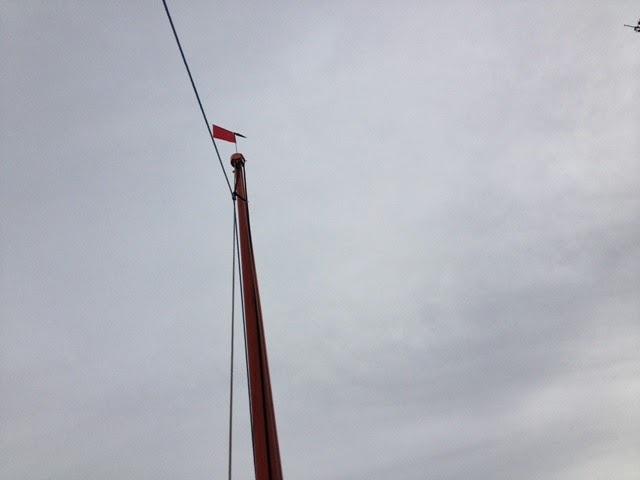 Race instruction will sometimes specify a signal flag to be flown at the stern such as one of the alphabetical or numerical flags taken from the International Code of Signals. Another thing I did today was to add extra screws for securing the storage racks. I always felt that single screws at the ends were insufficient for withstanding forces that may be imposed on them, especially when the boat is being tossed around in rough seas. I’m pleased I’ve put the deflated and packed canoe forward of bulkhead two, rather than stowing her on ‘Minnow’s’ foredeck. 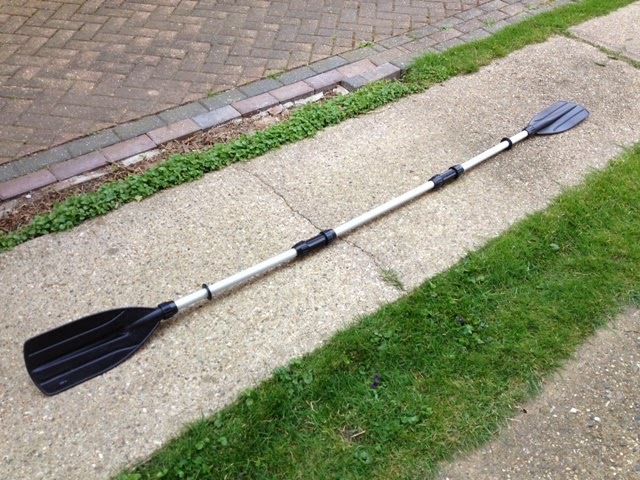 The double bladed paddle lashed to the starboard side deck was looking vulnerable; therefore I dissembled it for stowing within the boat. ‘Minnow’ is ready for an adventure, but I’m not! 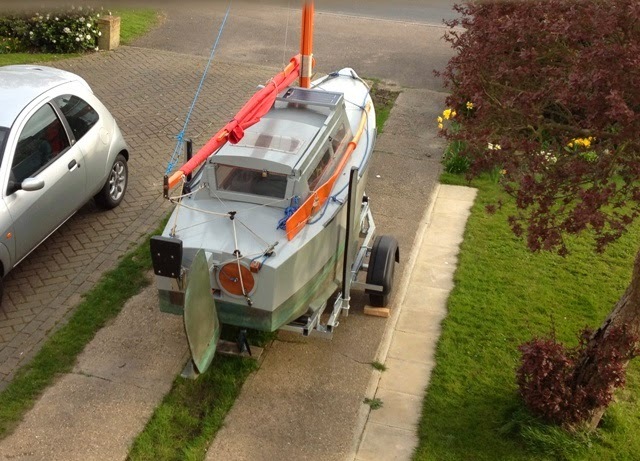 When various jobs at home have been completed, and there is a suitable weather window, I’ll give it a go - first to the River Crouch for a trial sail; then, if all goes well, perhaps to the River Swale. Having sailed thus far, I would decide whether to continue towards Ramsgate and Dover. A final decision would have to be made at Dover – continue to Plymouth along the South Coast, or return to the Crouch. Last year I took something like 42 days to sail from the Crouch to Plymouth. Therefore I must be realistic about my chances of arriving there by 10th May to watch the start of the Jester Challenge the following day. Practically all my cruising gear has been stowed aboard ‘Minnow’. She’s nearly ready to go. The problem is, I’m not ready, because I have several tasks before I can part from my wife for what may be several weeks. I’ve had second thoughts about stowing my inflatable canoe on the foredeck, because she would be exposed to the elements; furthermore, it’s far better to stow heavy objects below the waterline, or as close as possible to the waterline to act as positive ballast. 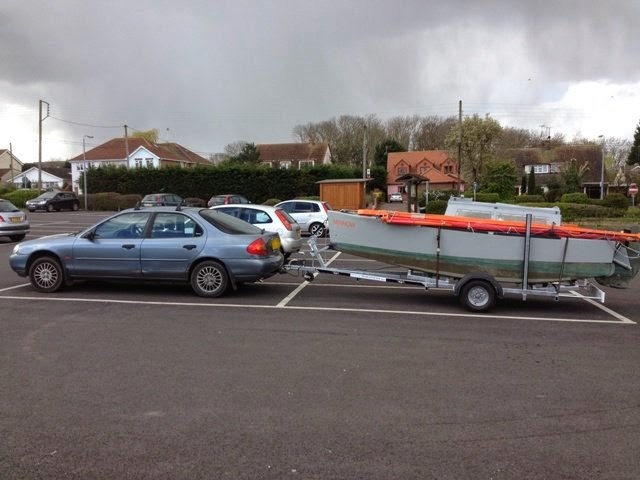 I believe the best place for the canoe will be forward of bulkhead two, set to starboard. I have slight reservations about her being there, because I shall have to make sure she is dry before putting her there. I’m not entirely happy about keeping the assembled double paddle on the side deck. Perhaps the answer will be to dissemble it and stow the components wherever they may fit. 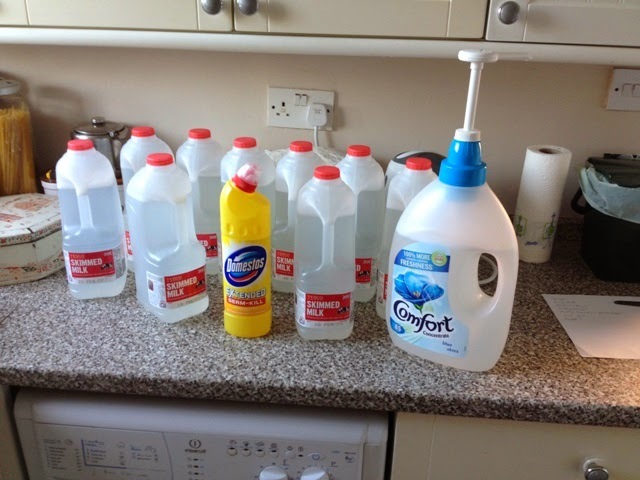 I think I’ve solved the drinking water problem by substituting the leaking milk cartons for a 4 litre can and two 2 litre bottles. Other liquid refreshment will take the form of soft drinks. I shall stow cartons of UHT milk in the floor lockers. Instead of putting dry foods in a large plastic container, I shall keep them in small waterproof containers in the locker under the seat. The plastic container will be good for temporarily stowing anchors until they are put in their respective jigs in the ground tackle locker. 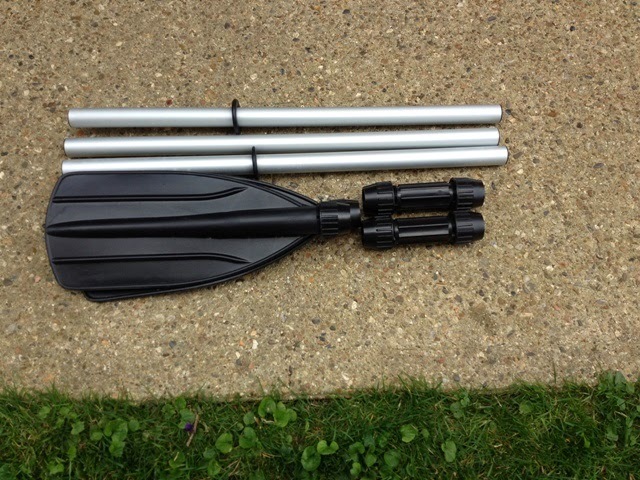 My clothing will be in a holdall stowed forward of bulkhead two, beside the packed canoe. Both sleeping bags and my self-inflating mattress will be in the forepeak. 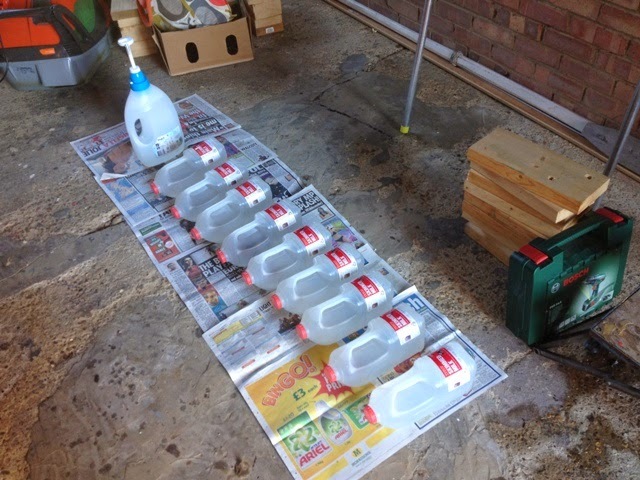 After sterilizing nine milk cartons for use as water containers I filled them to be tested for water tightness. 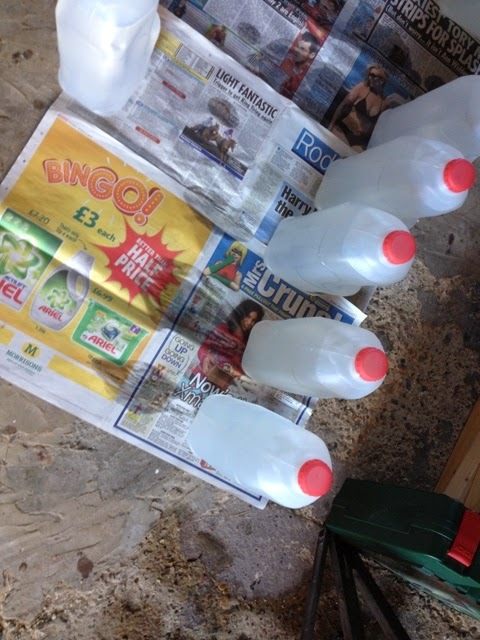 To check for leaks I placed them on newspaper so that minute traces of escaped water could be seen. Within minutes, all but one carton began to leak. Clearly that will not do, so it’s back to the drawing board. Perhaps stronger plastic bottles will do the trick. They must be similar in size to the milk cartons to fit snugly into the bilge lockers. I’ve put my trusted Bosun compass on Ebay at a starting bid of 10p. I had an identical compass for ‘Faith’, but it took up a lot of room and got in the way. 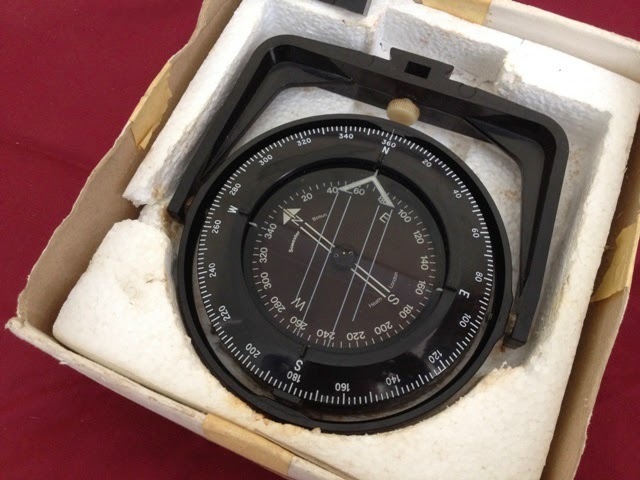 If you are interested in acquiring a good compass, visit Ebay.co.uk and enter this number into the search box: 161251200778. There are other Bosun compasses for auction, but mine is the only one with the modern rose. It is bubble free, and in working order. Get yourself a bargain. 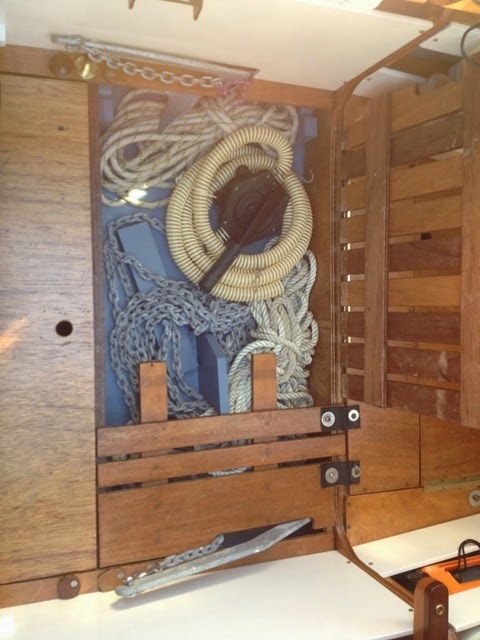 Many items have now been stowed on ‘Minnow’ in preparation for her first sail of the season. Clothing, food and liquid refreshment have yet to be taken aboard. I have sterilized nine milk cartons that I’ll fill with drinking water and stow amidships in bilge lockers. I have lined the lockers with non-slip rubber to minimize wear on the cartons. They should not slide from one side to the other when the boat changes tack. 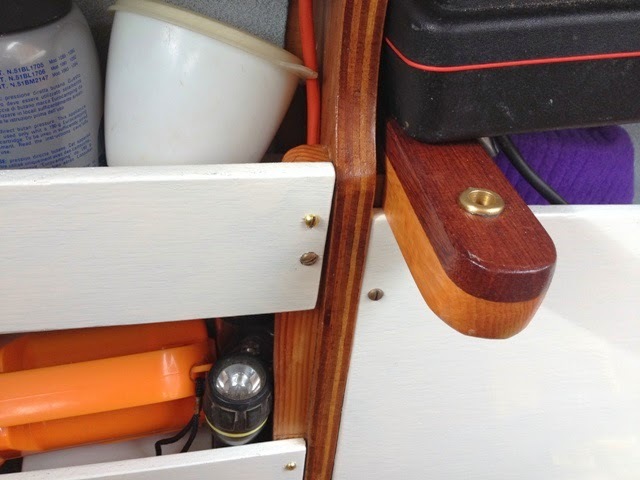 I am very pleased with the way items have fitted into the boat. 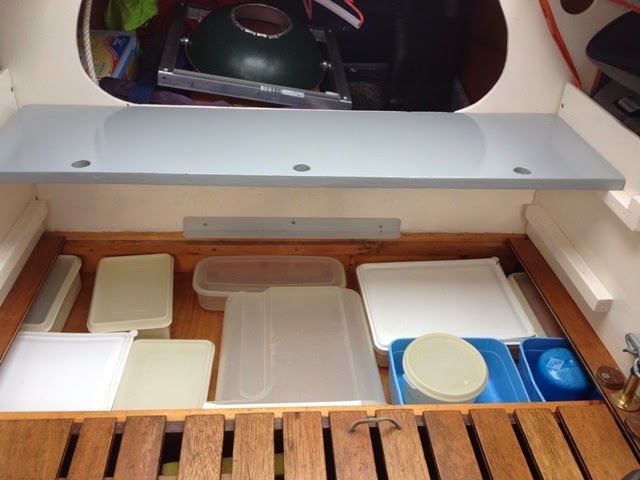 Bedding, clothing and the bulk of the lightweight dry foods will be stowed up forward. 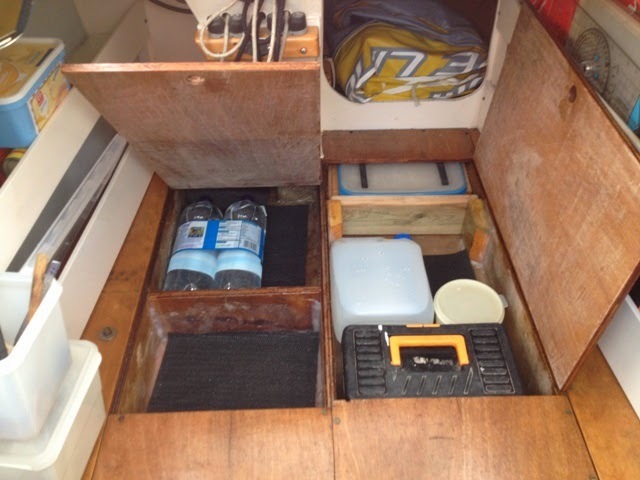 All items for working the boat will be within easy reach in the cabin. 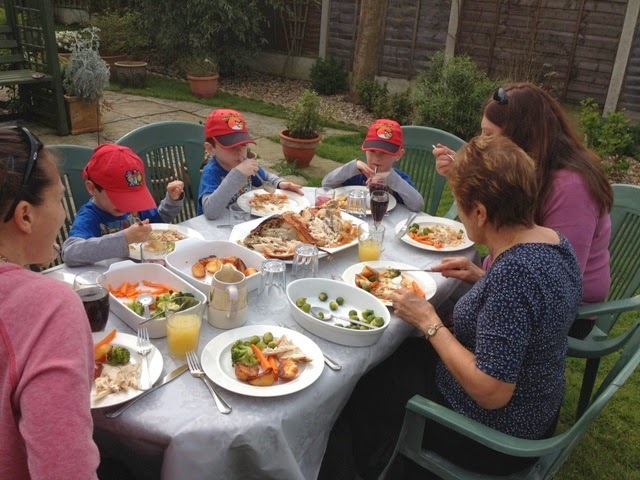 Wet gear, warps, fenders, Wellington boots, buoyancy jacket, washing up bowl, crockery, pots and pans, the cooker gimbal and few other small items will be in the lazarette. The inflatable canoe fits well on the foredeck, and her paddle is lashed beside the yuloh on the starboard side deck. 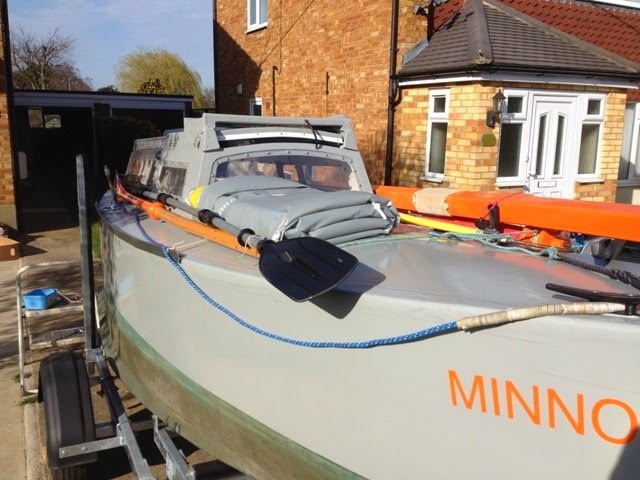 There’s not a great deal more to do before ‘Minnow’ will be ready for launching. I think I’ll take her for a short run on her road trailer to see how she goes. 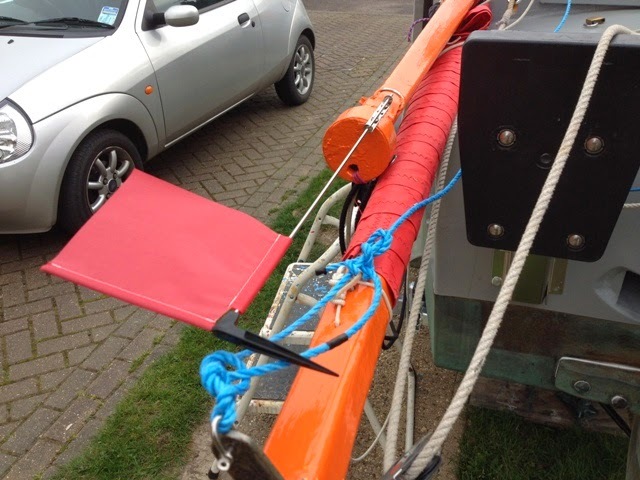 Her mast and rig will have to be securely lashed to the port side deck, and I’ll strap her to her trailer with two strops. Before I can set off for a sail, I have to attend to things that require attention at home. 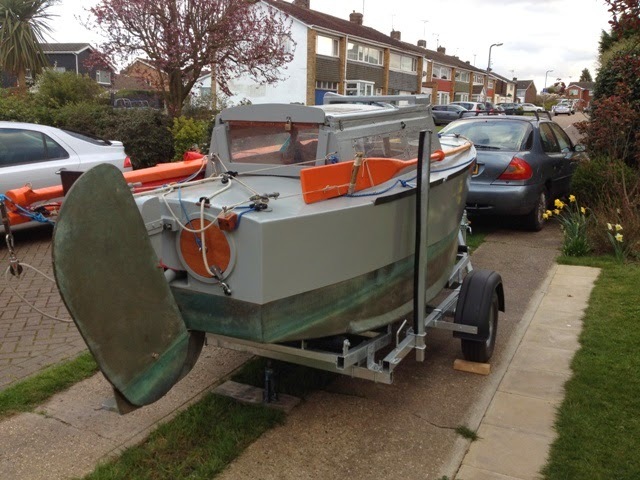 Once they have been dealt with, if I can find a good weather slot and the tides are right, all systems will be go! I’ve been looking at minute things requiring attention. 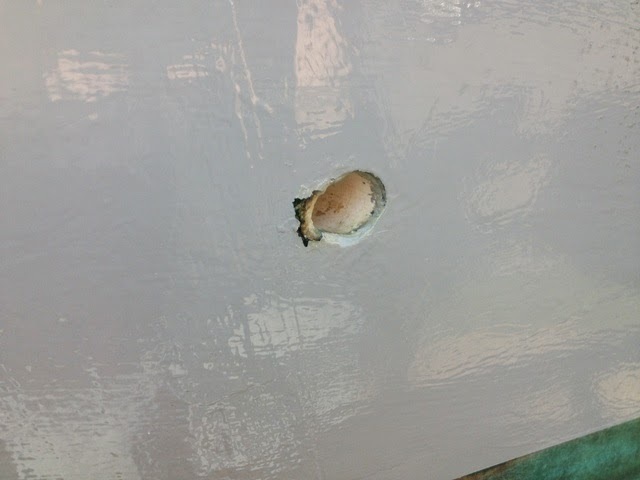 As today was warm, I took the opportunity to epoxy a few places with the aim of ensuring that water cannot pass through the fibreglass sheathing into the plywood that constitutes the main structure of the boat. There was a minute opening between the hull and the end of a pipe that passes through the bow. I have sealed it with epoxy resin. Had I not done so, water could have entered boat. The pipe was put there by ‘Minnow’s’ builder – presumably for attaching a bow fender. 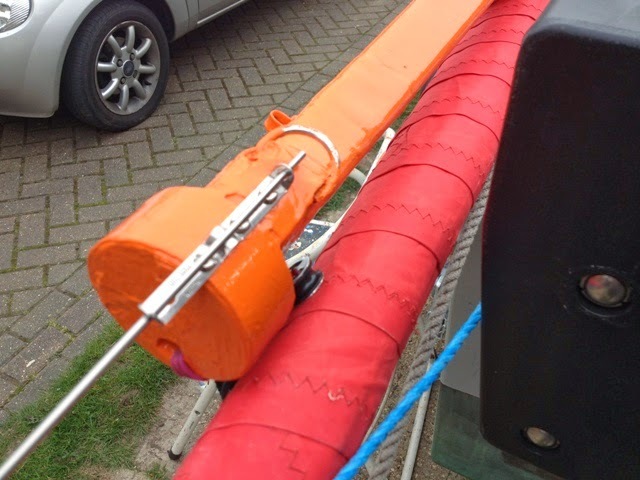 The structure is not robust enough to withstand compression loading from a towrope or from the trailer winch strop. 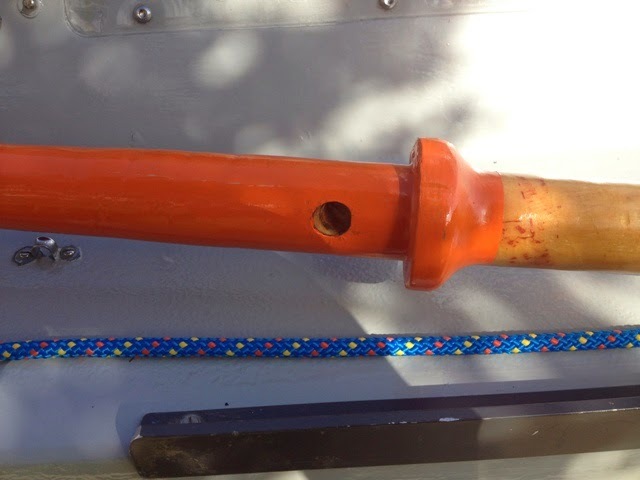 I applied yet another coating of epoxy to the join between the vent box drain pipe and the bottom of the boat. If there had been a leak there, I feel sure I’ve eradicated it. The old epoxy near the rudder tip and the upper edge of the rudder was a bit thin; therefore I gave both areas a fresh coating. 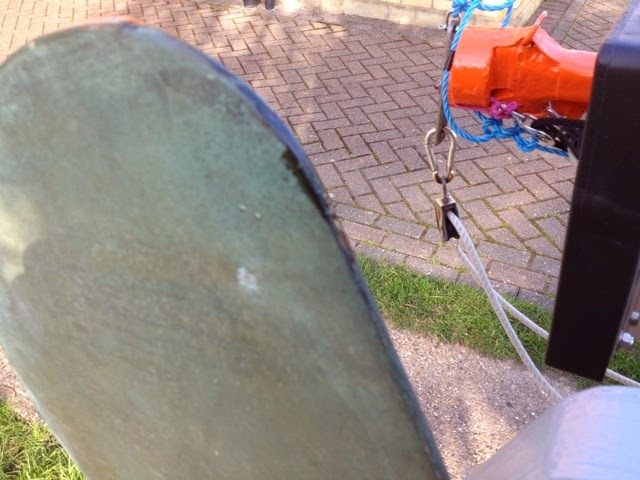 I also applied epoxy to a small area of the rudder step where the woven roving had come away from the plywood. Over the next few days I want to stow my cruising gear, food and water. When that is done, ‘Minnow’ will be ready for the big launch.